A new vendor – Bushdogs – recently joined the Pike Central family. George Bushwaller has been in the food industry since 1971. He had a restaurant in Frederick that he sold in 1990 when he moved down to Florida. 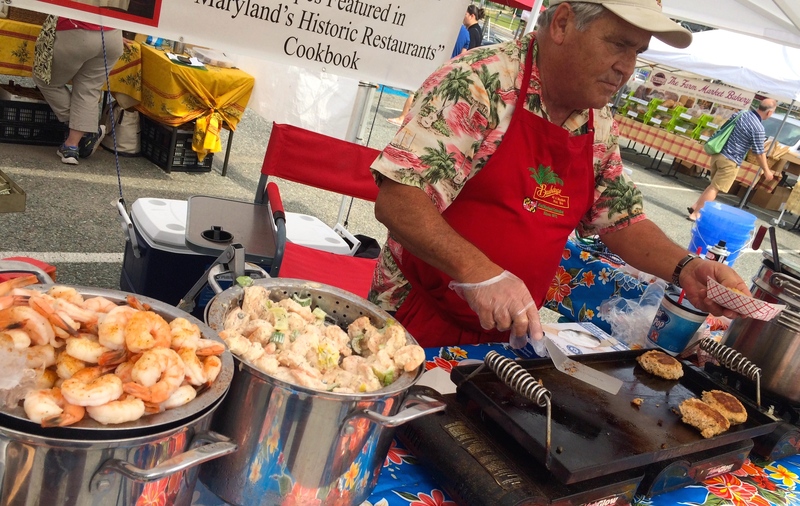 For the last 4 years he and his wife Joanna have been selling to farm markets in Florida, where MD style seafood is extremely popular. Recently, they decided to come back to George’s hometown to spread the love. They specialize in fresh, Maryland seafood. Nearly selling out the last few weeks at Pike Central Farm Market is something they are used to – people love their veggie-based MD Crab Soup and their Crab Bisque. They sell huge crab cakes with less than 1% breadcrumbs, and two different kinds of shrimp – Chesapeake Shrimp Salad (Imperial Style) and Old Bay Shrimp Cocktail. I chose the latter to create the recipe below and I was quite happy with my decision. 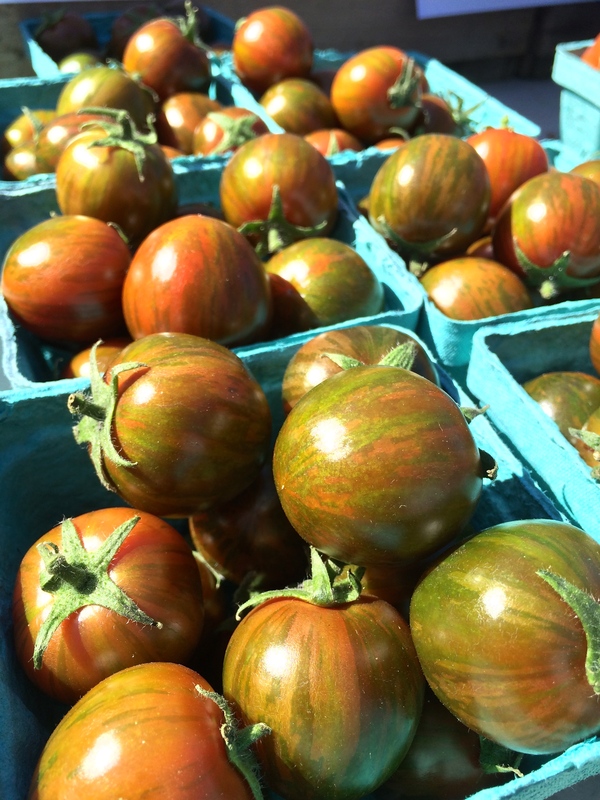 This time of year, Spiral Path Farm has amazing Sun Sugar Tomatoes available. These tomatoes won a taste contest last year and it is no surprise why – each one is bursting with the most unbelievable flavor. These tomatoes are one of my favorite snacks! I also used Spiral Path’s snow peas – another great snacking item. These legumes are peas that are eaten whole, shell and all, and are delicious raw or cooked. 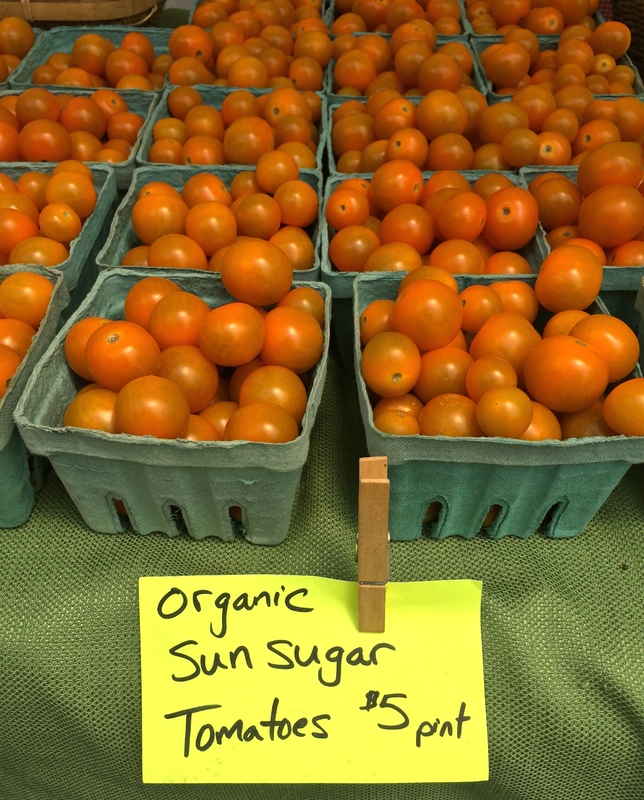 If you are unable to make it to Bethesda to grab these items from Spiral Path Farm, you can get the tomatoes from Mock’s Green House and the snow peas from Twin Springs Fruit Farm – both are at all three Central Farm Markets locations. 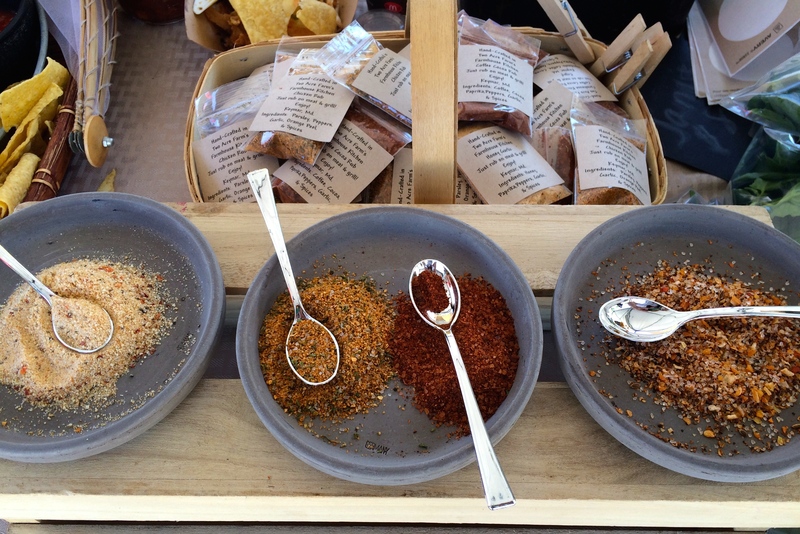 Another gem in this recipe is the spice blend from Two Acre Farm. Nicole Olson makes some of the most interesting amalgamations of spices and sells them in tiny bags with cute labels on them. In the recipe, I left the spice blend choice open-ended because there are so many different options. I used Ragin’ Cajun, a blend that Nicole said would work very well with the Old Bay used to cook Bushdog’s shrimp. She was not mistaken. Other flavors include Honey Garlic and Coffee Cocoa. One of my favorite things to do during the week is challenge myself to create dishes using only ingredients from the market, without a single store-bought ingredient. I am happy to say that this delicious recipe fits that bill – everything can be found at one or all of the Central Farm Markets locations. Cook pasta according to instructions. When the pasta is cooked and drained, immediately toss it with 2 Tbsp. Olive Oil. Set aside. Using the coarsest side of a box grater, grate the zucchini. Thinly slice the pearl onions, using only the white parts. Pick the stems off of the snow peas. Cut the tomatoes into quarters. Add 2 Tbsp. Olive Oil to a large pan. When the oil is hot, add the onions and 2 tsp. of the Spice Blend. Cook, stirring frequently, until onions are tender and fragrant, about 4 minutes. 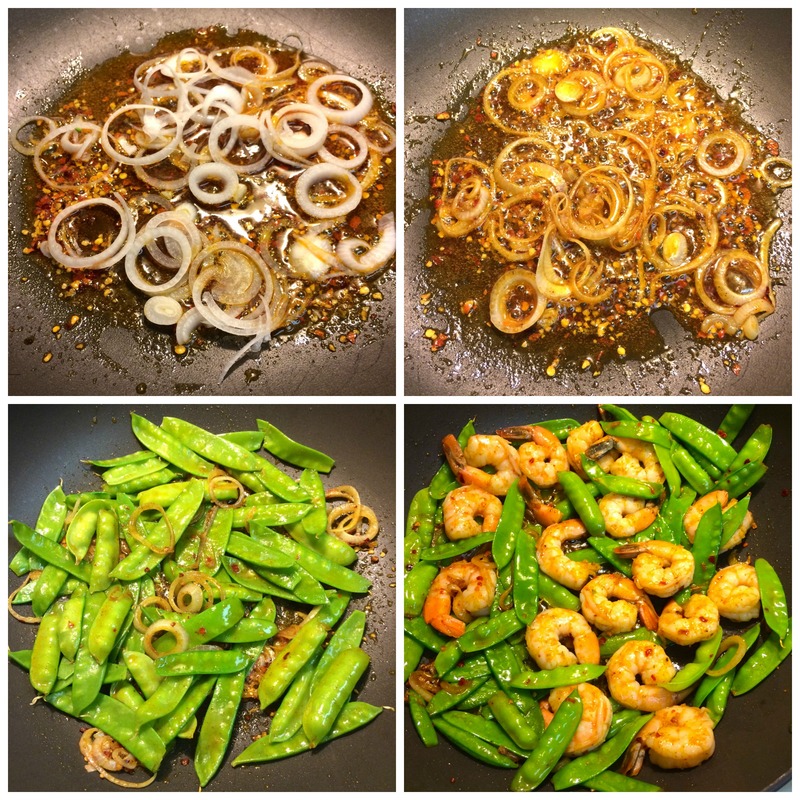 Add the snow peas and shrimp to the pan and toss to coat. Add the remaining 1 Tbsp. of Olive Oil and another 1-2 tsp. of the Spice Blend (depending on your taste buds – I like a lot of flavor so I added more). When the snow peas begin to get translucent and the shrimp is heated, turn off the stove and add the zucchini. Cook for 2 minutes, to keep the crunch of the zucchini. Toss the pasta into the pan and mix everything together. Add salt, pepper, and Spice Blend to taste. Plate your dish and garnish with delicious sun sugar tomato slices and if desired, asiago cheese shavings. Spring is by far my favorite season of the year. Everyone starts to get excited about the warmer weather, flowers begin to bloom like crazy, and the farm stands at Central Farm Markets become packed with fun, new produce for me to play with! 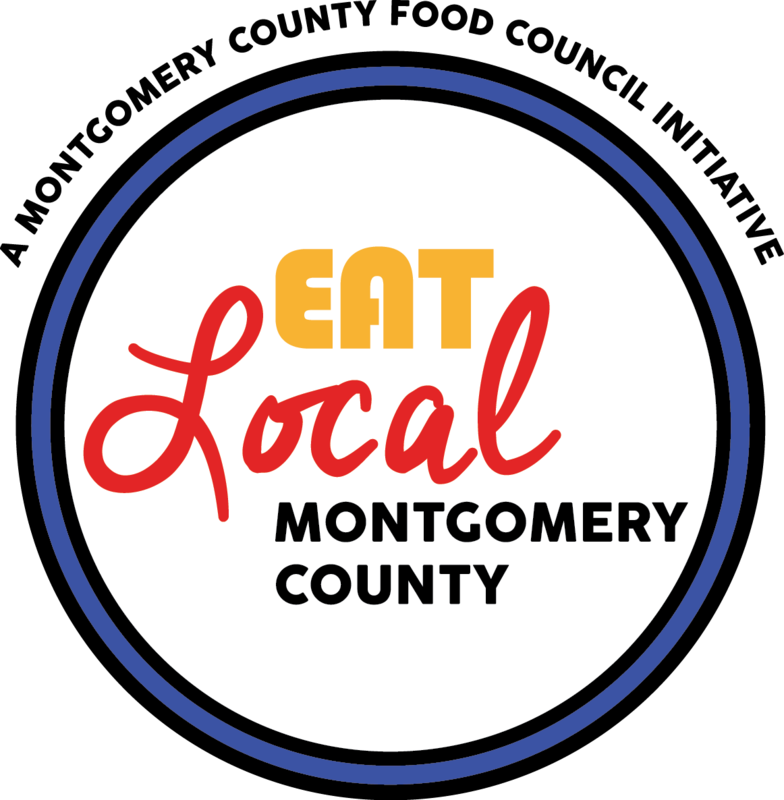 The Montgomery County Food Council has a contest running called the Eat Local Challenge. Contestants are given a virtual basket of seasonal ingredients that can be found locally and are challenged to create an original recipe using these ingredients. I’ve decided to put my recipe-creating skills to the test and create my own. The ingredients I’ve used from their virtual basket are: chicken thighs, Dress It Up Dressing, eggs, chives and radishes. Other ingredients in the basket are lamb and beets. 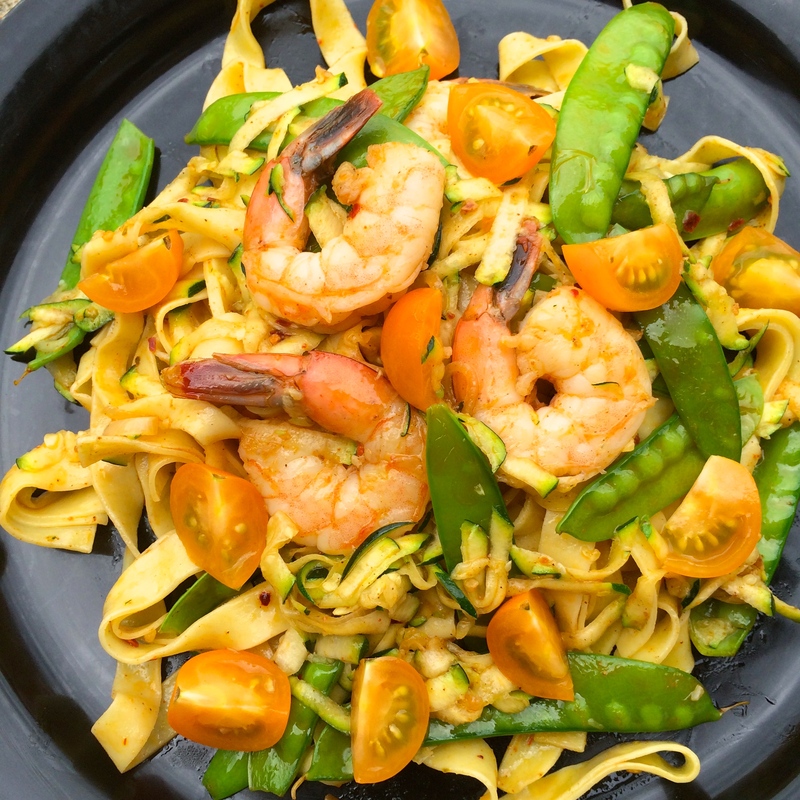 One prize for this contest is having the winning recipe shown as a demo at Bethesda Central Farm Market! I decided to test my breading and frying skills and added some fresh chives to the breadcrumbs. 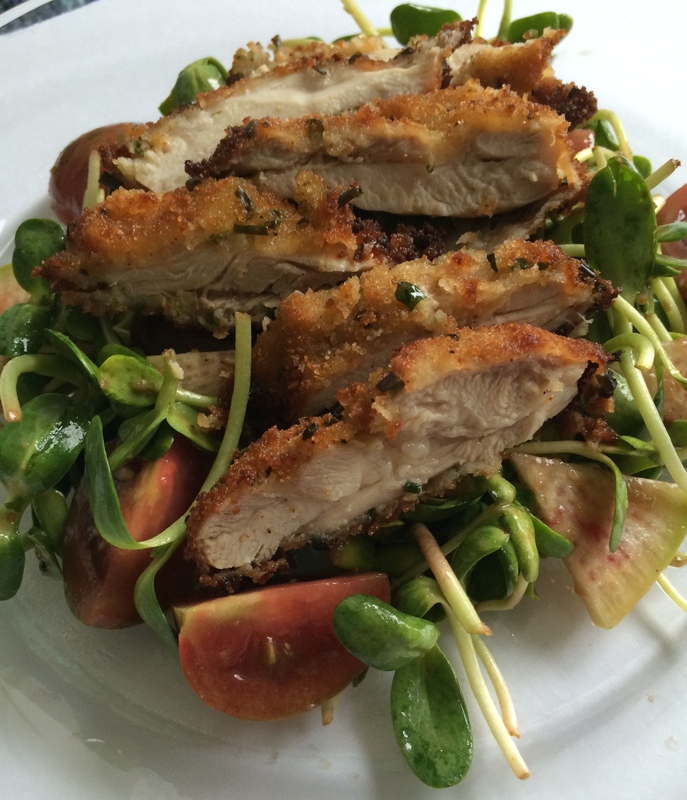 A salad on the side gave me the perfect opportunity to showcase two other fabulous items that have popped up this Spring – sunflower sprouts and tomatoes! 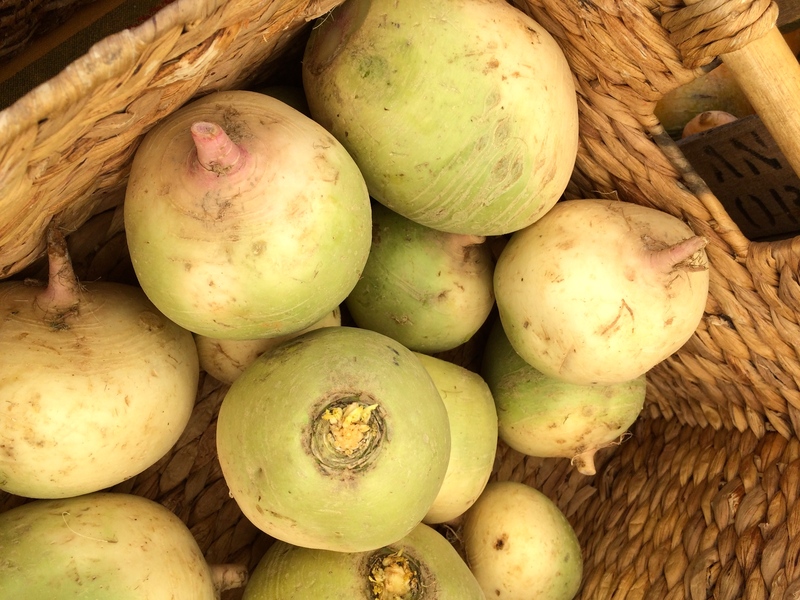 Unlike the common red globe radish, the watermelon radish has a muted green to white exterior and a fleshy, bright-pink interior. It is also much larger than a typical radish, weighing up to one pound. The flavor is less peppery and much sweeter than other radishes. Radishes are a wonderful source of vitamins A and C, and due to their water content, are great for maintaining hydration. I used chicken thighs from Springfield Farm, one of our farms that practices sustainable agricultural methods and where the animals are given no hormones, chemicals or antibiotics. There are currently three generations of the same family working on the farm! 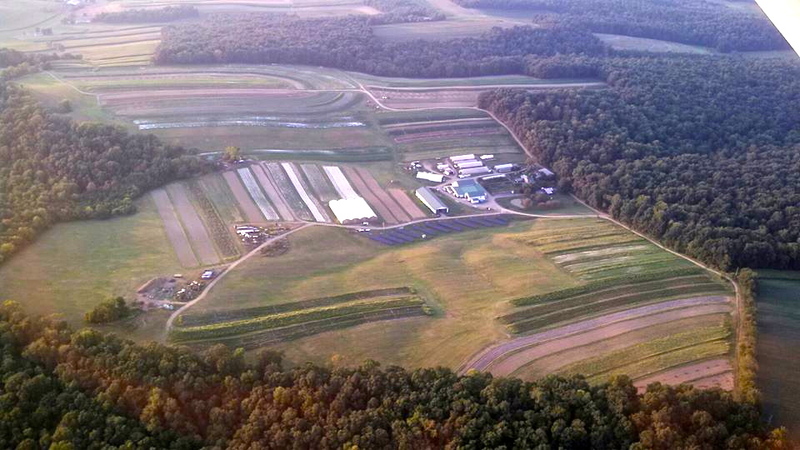 They raise chicken, turkeys, pigs, and cows on almost 70 acres in Baltimore County. The family still lives on the property in a house that was built by their ancestors almost 300 years ago. 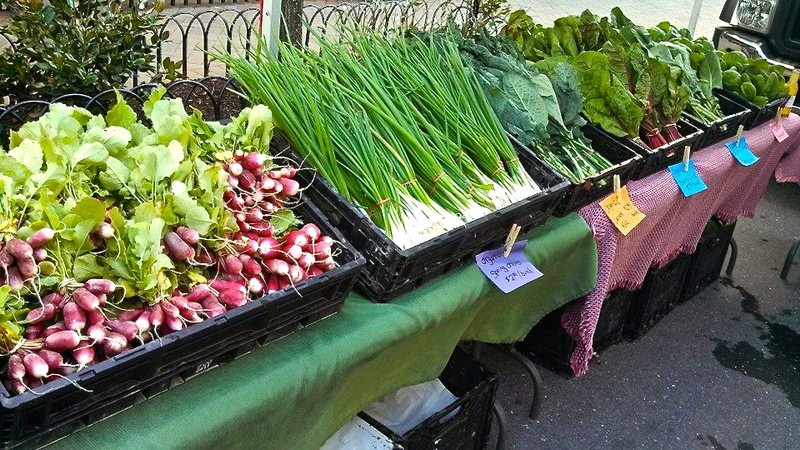 Springfield Farm will be at all three of our markets this season! And now it’s time to get to the recipe! As always, I’ve specified where I purchased each ingredient from the market in parentheses. Marinate the chicken thighs overnight or at least 3 hours in the dressing. Whisk the eggs and place in a shallow dish. 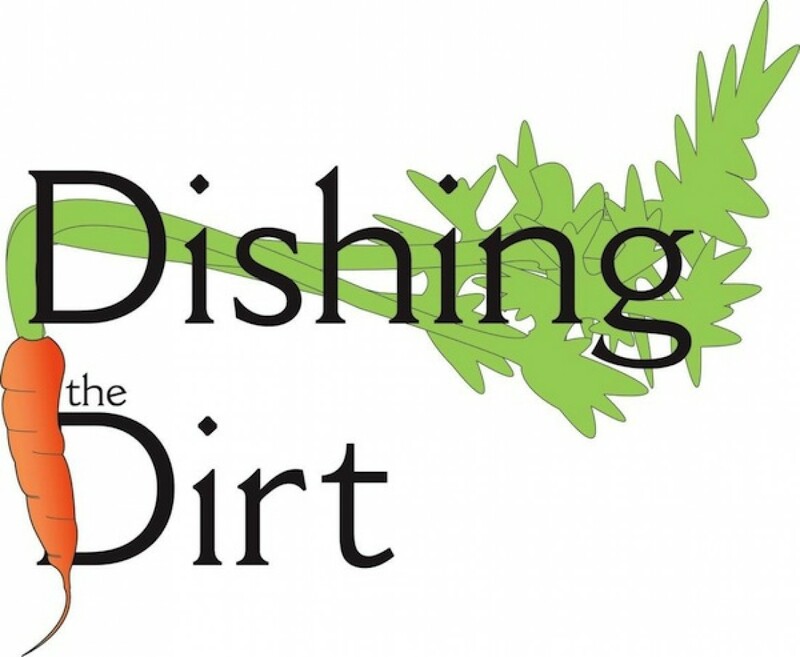 Combine the chives and the bread crumbs and salt and pepper to taste, and place in a shallow dish. Pat chicken thighs dry, wiping off excess dressing. Dip one chicken thigh into the eggs, coating it completely on all sides. Dip the thigh in the chive mixture, making sure to coat all sides. Repeat with remaining chicken thigh. Heat about ¼ inch of canola oil in a medium sized pan. When the chicken thighs are breaded and the oil is hot, place the chicken in the pan for about 1 minute per side. Place seared thighs on an oven sheet and bake in the oven for 10 minutes or until cooked through. Meanwhile, make the salad. Slice the watermelon radish into rounds. Cut the rounds into 8 slices. Cut the tomatoes into quarters. 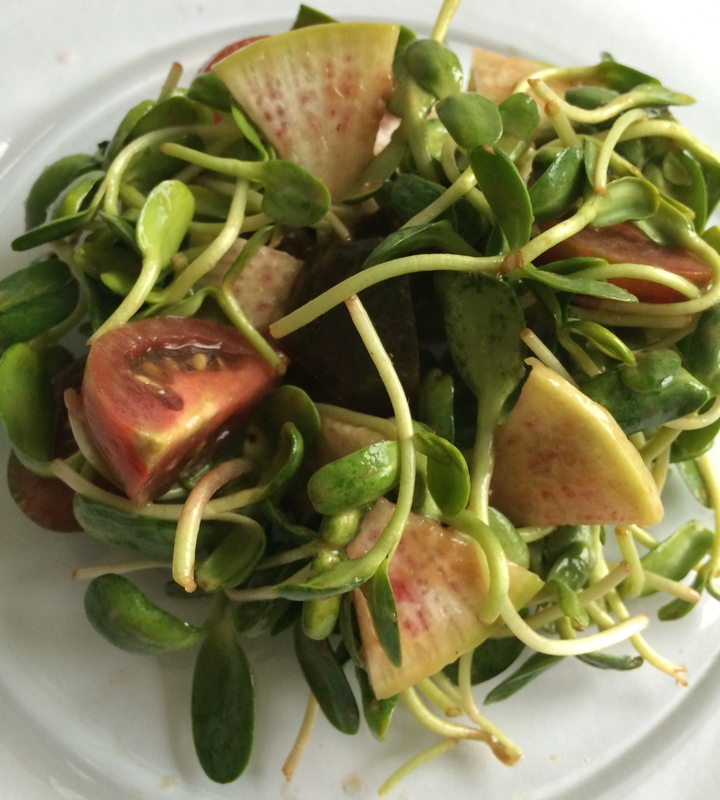 Place sunflower sprouts, radish slices, and tomatoes in a bowl. Add the dressing. Toss to combine. Let chicken thighs cool to room temperature. Slice and place on salad. Enjoy! Lucas Brownback has lived on Spiral Path Farm his whole life. 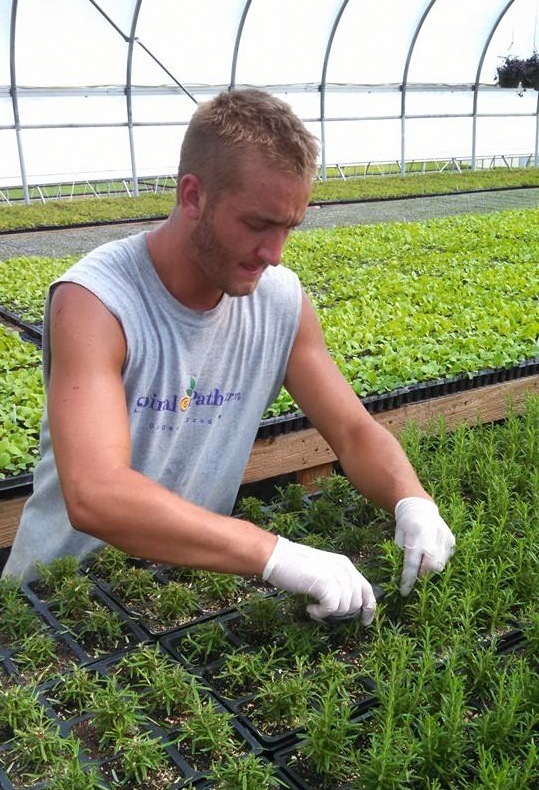 Located near Loysville, PA, the farm has been the home of his parents and family for 36 years. He and his brother work the 255 acres themselves, planting and harvesting all of their produce with such personal care and detail, it’s amazing they have time for anything else! The farm was certified organic in 1994 and twenty years later, the Brownback family is still wholly committed to continuing their sustainable and organic practices. I was lucky enough to visit the farm on a beautiful day in early August, and what I saw really opened my eyes to this type of farming. When I drove up, Lucas was on his knees picking herbs from a beautiful garden planted directly in front of his parents’ house. His father, a hobby-builder, designed the house himself. With views of the Pennsylvania mountains surrounding the farm, Spiral Path is truly a sanctuary away from the hustle and bustle of the urban existence that I’ve known my whole life. The perfectly manicured and expertly organized rows of crops are breathtaking, reflecting the amount of work that goes into running a farm of this size. The reason for my initial surprise was simply the sheer size of the whole operation. 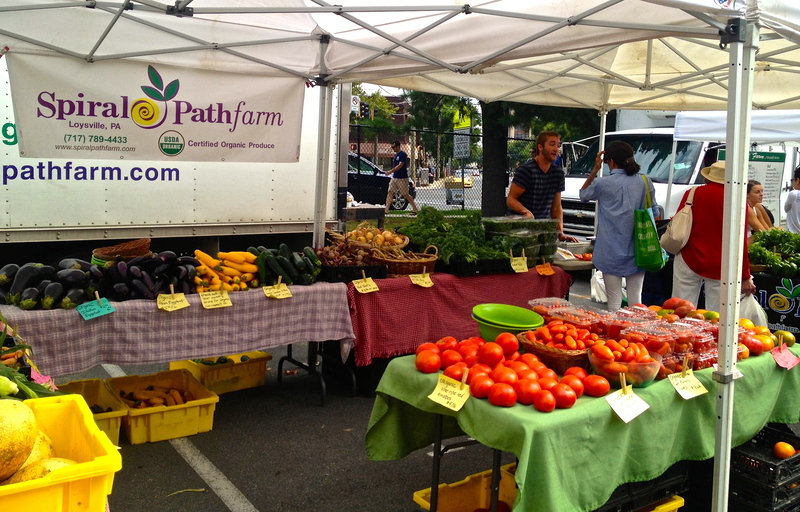 If you’ve seen Lucas’ stand at the Bethesda Central Farm Market, you’ll agree- it’s very unassuming. 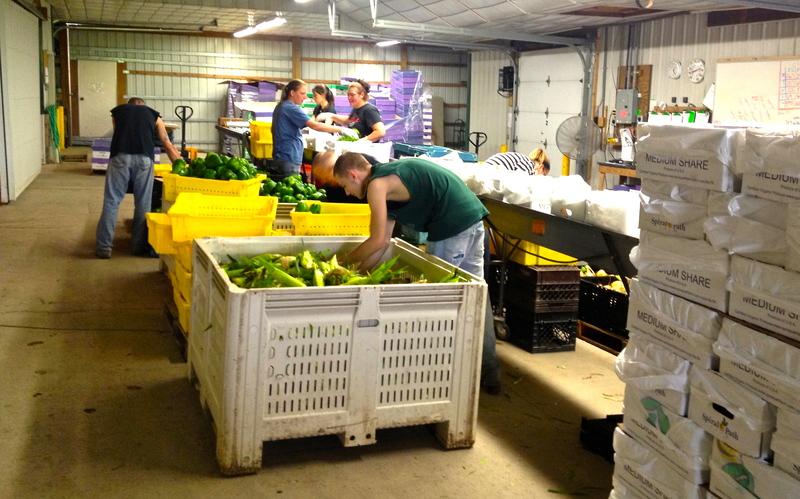 Beautiful produce, sure, but you would never guess the magnitude of their farm operation. Lucas tells me that much of their produce is actually sold wholesale at Wegmans, with the other majority going to their CSA customers – a great way for subscribers to receive “a wide variety of local in-season foods harvested at the peak of their ripeness, flavor, vitamin and mineral content.” The abundant bounty of produce we see at Spiral Path’s stand every weekend is nothing compared to what this farm produces on a regular basis! Lucas only takes cash at the market. He might be one of the few vendors who continues this practice. To him, it’s a matter of principle. His goal is to keep the middleman out of the process – to promote the cash going to the producer with no hands in between. Although he will admit that this might prohibit some sales, to him, the message is the most important part. And he’ll tell you, “I drove all the way out here to bring you food, you can put in the effort to stop by the ATM on your way here!” As a patron, he said that to me when I asked about the cash-only policy. I totally got it! And I really appreciate where he’s coming from. Stop by the Spiral Path Farm Stand on Sundays and take in the beautiful array of vibrant, colorful organic produce that Lucas and his whole family work so hard to bring to us. They have a wonderfully tasty salad mix, super fresh kale, beautiful eggplants, tomatoes, zucchini and a variety of squashes. Ask him about the farm and talk to him about what you do with your veggies. He’s always there with the biggest smile, waiting to help you eat healthfully, locally and sustainably.